The perfect combination of sun, sea and wind make Porto Pollo and the Isola dei Gabbiani one of the favourite destinations for surfers from around the world. Windsurfing, kitesurfing and sailing all provide non-stop thrills for experts and beginners alike. Calling all you free spirits spending your holidays in Sardinia! You absolutely must NOT miss out on a day at Porto Pollo, the spiritual home of windsurfing and one of the best destinations near Palau where the order of the day is sea, sport and fun. This small stretch of land that connects the mainland to the Isola dei Gabbiani is almost a little world in itself, a meeting point for people from all over the world, brought together by the desire to enjoy the sea from every point of view. 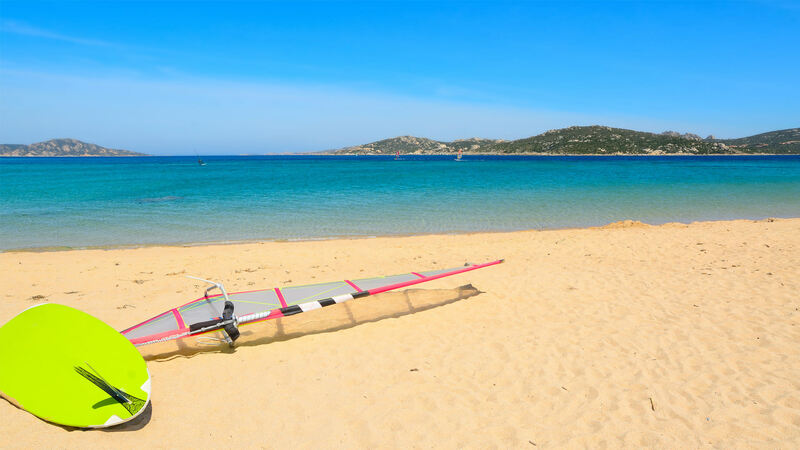 Porto Pollo or Porto Puddu, considered one of the top European hot spots and a surfer’s paradise for 30 years was discovered in the 1980s by windsurfing legend Robby Naish. Every day from March to October, the sport’s up-and-coming youngsters set the sea and sky alight in a spectacle of multicoloured sails and acrobatics stretching as far as the islands of the nearby La Maddalena Archipelago. For those interested in starting windsurfing, Porto Pollo is the perfect place to take some lessons and the right opportunity to experience the thrill of flying a wing driven by the wind while always under the attentive eye of supportive instructors and professionals. And if fun and games are guaranteed during the day, the mood continues when the sun goes down with unforgettable aperitifs at one of the many beach bars, often accompanied by live music, percussion from a number of artists and dj sets, all in the company of laid-back new friends, dancing barefoot on the sand in a hippie-style atmosphere. An experience absolutely not to be missed and one of the things to do in Palau! A popular destination for young people and families who like active holidays, the Isola dei Gabbiani is just ten minutes from the Hotel Cala di Lepre, the Palau hotel dedicated to those who like to keep in shape even while on holiday. Delphina’s sports and activity hotel offers a wide range of sports activities, of which some are free, like archery, 5-a-side football, beach volleyball and tennis and others for which a charge is made, such as horse riding, SUP, sailing, kayaking and windsurf courses, whether in the hotel’s partner Sporting Club Sardinia in Porto Pollo, or at the school a short distance from the hotel itself.